I’m going to slip into a pattern here, with three titles that you’ll be seeing one each in each Pull List for a while; Guardians of the Galaxy, My Little Pony: Friendship is Magic and Teenage Mutant Ninja Turtles. I guess if you don’t care for one of those, you’ll be doing a lot of skipping. If you don’t like two of them, you’ll definitely want to skip these. And if you absolutely can’t stand any of them, that’s pretty bad. It probably means you don’t like comic books. That’s okay. Maybe you got a really bad paper cut from one as a child. That could scar you for life, I guess. Not literally. Paper cuts don’t tend to lend scars. 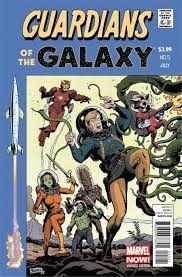 After four issues of me complaining about how Brian Michael Bendis can’t write Rocket Raccoon, we finally get an issue of Guardians of the Galaxy where Rocket Raccoon is well written. Certainly, he’s kind of a jerk to Tony Stark, but he’s a funny jerk – and besides, it’s Tony Stark. He probably deserves it. The opening scene where Rocket fixes a broken Iron Man suit like it’s nothing while admonishing Tony for his rendezvous with Gamora is pretty hilarious. Tony admits he has a thing for Green Space Babes. Speaking of Green Space Babes and characters Bendis can’t write, former kinda-furry Guardian Mantis makes an appearance. 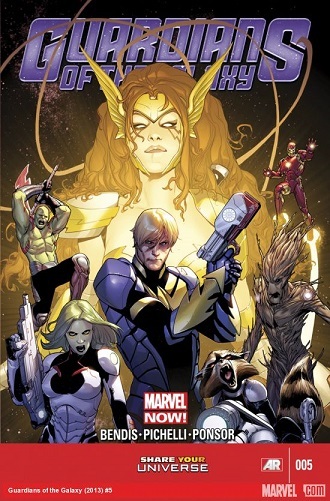 She’s here to explain the events of the recent “Age of Ultron” event, and how that caused time and space to be ruptured. Long story. Anyway, it turns out Marvel has gotten the rights to another comic company’s character, and she was written by Neil Gaiman! Boy, this should be exciting, right? Actually, it’s just Angela, a Spawn character so obscure I think even Gaiman had to be shocked anyone cared. Marvel set up this big crossover event to bring a non-Marvel character into the Marvel universe, and brought in the comic book equivalent of Wii Fit Trainer (a Japanese phrase meaning “stop emailing me character suggestions for Super Smash Bros.”). At least Marvel was limited by who they could get. Though I’m not sure if putting the universe’s new mysterious warrior woman on the team who already has a mysterious warrior woman is the best idea. Big McIntosh gets the spotlight for this issue, the first half of a two-part story entitled “Zen and the Art of Gazebo Repair.” Granny Smith hears the Apple family’s gazebo squeaking, and Big Mac for some reason needs nails to repair it. Unfortunately, Big Mac is all out of nails, so he ventures into Ponyville in search of some, only to find the Summer Wrap-Up Festival and Hoedown fair has taken over town. 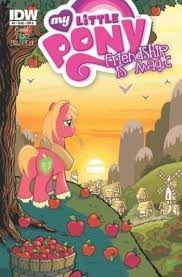 The silly setup is about as good as you’ll get for a cohesive plot in this vaguely-connected series of gags involving Big Mac and his encounters with the citizens of Ponyville. The Cutie Mark Crusaders are trying to get their cutie mark in accidentally blowing up stuff with fireworks, the Cakes need a babysitter, the Great and Powerful Trixie puts on a puppet show, Diamond Tiara and Silver Spoon give out advice, Princess Luna reveals her fondness for slogan T-shirts and Derpy speaks – which means this issue will become worth a lot of money when it gets banned from reprints. However, the best gag involves Big Mac’s page long conversation with Bulk Biceps. Katie Cook and Andy Price are the team that work best when they’re just goofing off. Yeah, I didn’t exactly like the second half of their first arc, but having put out the best of the Mane Six’s Micro-Series, they’re still good in my book. 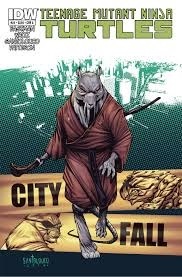 Continuing the “Cityfall” arc, the turtles finally learn that Leonardo, brainwashed by Shredder and the Foot, has become their worst enemy. The team’s outlook doesn't get any brighter after a confrontation in a dark warehouse. One of the pieces of the puzzle that hasn’t changed at the end of the issue is the turtle’s relationship to Old Hob. That’s not to say that the relationship doesn’t change radically every other page inside the issue. Old Hob gets the award for best supporting character in this issue, as he plays the always interesting part of the guy you can’t trust but have to trust anyway in the dire situation you are presented with. There’s a wonderful page where Hob asks why everyone thinks he’s lying; when everyone just glares at him for a panel, he lamely assures them he isn’t. But what can the turtles do? He’s their only way to get to Leonardo. As always, Mateus Santolouco’s art is a highlight of the issue. He does both quiet, expository scenes and action scenes well. Also, his take on Old Hob is the best in the series; the character has not always looked that good issue to issue, but here he’s fun as written and fun as drawn. I pretty much gave up on comic books when the publishers began to renumber them all from #1 again. That's rewriting history, and I like historical accuracy even more than I like comic books. Besides, I ran out of room to store them all. Also, I discovered that anything decent will be collected into graphic novels. Eventually. Well, I guess my ALL-NOW, ALL-TIME, ALL-SPECTACULAR REBOOT SPECIAL NEW PULL LIST #1 isn't going to be to your tastes. Aw, how cute, let's give a dumb superhero comic a cover like the (in)famous EC Comics of the 50s. Chances said superhero comic will actually be as hard-boiled and ballsy as the EC Comics of the 50s? Not much to be honest.